What: The new-look River Kings head to the desert to face the Rattlers. When: Sunday, March 3 at 2:05 p.m. pacific (4:05 p.m. central). 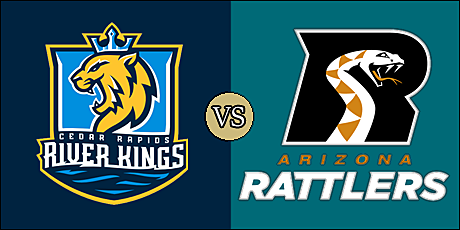 2019 Head to Head: June 1 - Rattlers at River Kings. Note: These teams battled in the the IFL's highest scoring game last season, an 84-83 Rattlers win in Phoenix. The River Kings are 0-1 overall and 0-0 on the road. 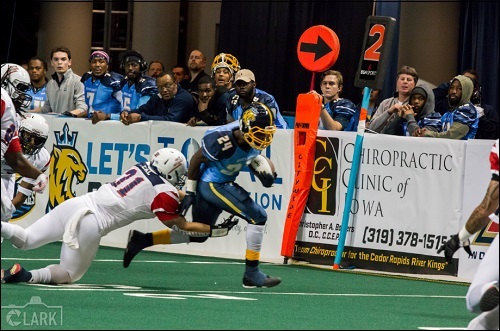 They are coming off a 47-44 home loss to the Sioux Falls Storm on February 23. The Rattlers are 1-0 overall and 0-0 at home. They are coming off a 51-21 road win over the Green Bay Blizzard on February 24. River Kings RB Nathaniel Chavious. As mentioned above, the last time these two teams met in Phoenix it ended in a thrilling, last second 84-83 win by the Rattlers. The game was notable for several performances; most notably Darrell Monroe rushing for an IFL record 11 touchdowns (all from Six yards or less) off of 140 yards. Cedar Rapids quarterback Jake Medlock was nearly perfect as he completed 12 of 13 passes for 210 yards with six touchdowns and no interceptions. 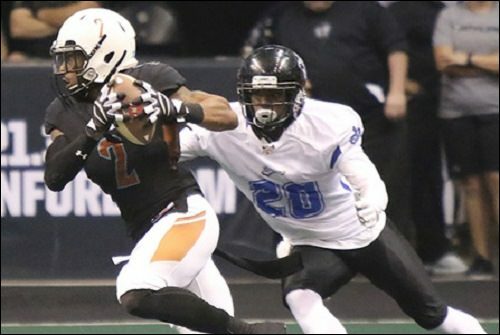 The stage is different now, as Monroe is not on the Rattlers' roster and, after a brief off-season stint in the National Arena League, Medlock signed this week with the Tucson Sugar Skulls. The re-vamped River Kings looked promising in their opener before falling to the Sioux Falls Storm on a last-second field goal. The Rattlers ran over the Green Bay Blizzard in last week's opener, 51-21. They will look to get on a roll and get back to the United Bowl, beginning with this win. The River Kings seem to have found Medlock's replacement. Kurt Palandech had a solid outing in his IFL debut, completing 16 of 21 passes for 180 yards with three touchdowns. He also ran for a score to go along with 35 yards on six carries. Nathaniel Chavious rushed for 19 yards with a pair of trips to the end zone. Returning wide receiver Marquel Wade was back in form with the River Kings in the opener. The veteran receiver hauled in seven passes for 95 yards and a pair of touchdowns. He should be expected to be the primary target for the rookie quarterback. Jordan Smith also should figure into the mix at receiver after catching three balls for 46 yards and a touchdown last week. Defensive backs Tavion Garrison, Travonti Johnson and Ricky Johnson are a formidable in the backfield , while linebacker Malik Slater had the team's lone sack last week. Henry Nell comes in after hitting five of six extra points, as well as a 35-yard field goal against the Storm. The Rattlers had few problems with the Blizzard last week, and may have found a new foundation in the ground game. The quarterback position is still a carousel between Jeff Ziemba and Verlon Reed, Jr. Each played a half and had similar overall results. Ziemba threw for 97 yards while Reed rushed for a pair of scores. Jabre Lolley found the end zone four times; three on the ground and one through the air. His 88 rushing yards were second in the IFL last week. Anthony Amos is one of the most -- if not the most -- reliable receivers in Rattlers history, and Dezmon Epps is explosive. Allen Chapman and Devin Cockrell each had an interception in the opener. The key on defense is lineman Joshua Gordon, who recorded three sacks, including one for a safety. Linebacker Ricky Wyatt, Jr. is another one to watch after leading the team in total tackles with a sack last week. Jimmy Camacho was perfect last week, nailing all seven of his field goal attempts. Rattlers have the ball first. Touchdown Rattlers. Jabre Lolley 5 yard run. Jimmy Camacho kick. FG River Kings. Henry Nell 50 yards. Touchdown Rattlers. Dezmon Epps 54 yard kickoff return. Jimmy Camacho kick. Touchdown Rattlers. Dezmon Epps 34 yard pass from Verlon Reed. Jimmy Camacho kick. Touchdown River Kings. Kurt Palandech 1 yard run. Henry Nell kick. Touchdown Rattlers. Verlon Reed 44 yard run. Jimmy Camacho kick failed. Touchdown River Kings. Khari Kimbrough 10 yard pass from Kurt Palandech. Henry Nell kick. Touchdown Rattlers. Jamal Miles 4 yard run. Jimmy Camacho kick failed. Rattlers try an onside kick and recover it. Touchdown Rattlers. Jabre Lolley 6 yard run. Jimmy Camacho kick failed. Touchdown River Kings. Kurt Palandech 25 yard run. Henry Nell kick. Touchdown Rattlers. Anthony Amos 18 yard pass from Verlon Reed. Jimmy Camacho kick.